Baked scrambled eggs free up your stovetop during the busy breakfast rush. Heat oven to 350°F. Beat eggs, milk, salt, and pepper in bowl until blended. Pour egg mixture into lightly greased baking pan. Bake in 350°F oven until eggs begin to set, about 7 minutes. Leaving pan in oven, pull out oven rack. Gently pull the eggs completely across the bottom and sides of pan with an inverted spatula, forming large, soft curds. Continue baking. 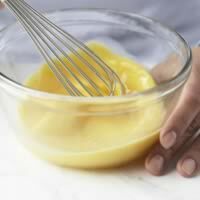 Pull eggs with spatula a few more times until thickened and no visible liquid egg remains, 12–15 minutes. Remove from oven. Serve immediately.